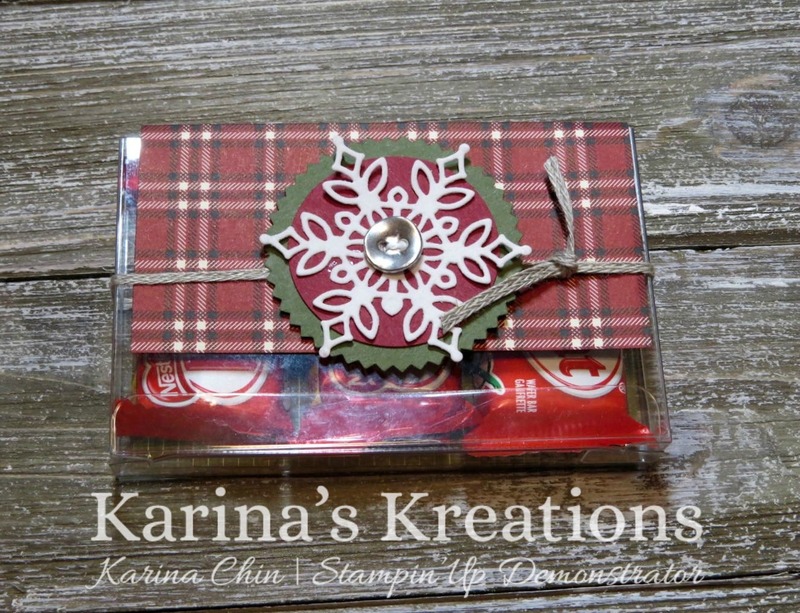 Karina's Kreations: Stampin'Up Snowfall Thinlit Die Treat Holder! 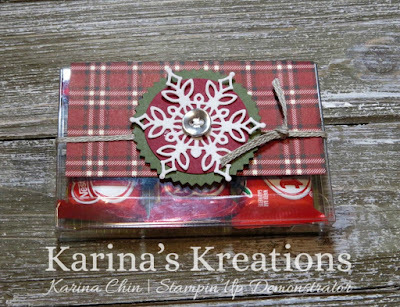 Stampin'Up Snowfall Thinlit Die Treat Holder! Have you ordered the Snowflake Showcase products yet? I have another fun project to share with you. This cute treat holder is made using half of an acetate box and the Snowflake thinlit die cut out of a White Velvet Sheet. I cut a piece of 4-1/4" x 5-1/2" Country Lane Designer Series Paper amd scored it at 2-7/8" and 3-3/8". I slide the paper inside the box, added the treats and folded over the designer series paper. I tied Braided Linen trim around the box to help the box stay closed. The snow flake was attached to Cherry Cobbler card stock punched out with the 1-3/4" circle die and Mossy Meadow card stock punched out with the Star burst punch. To place an online order, please click on a picture below and use this hostess code UQZQ4H27.